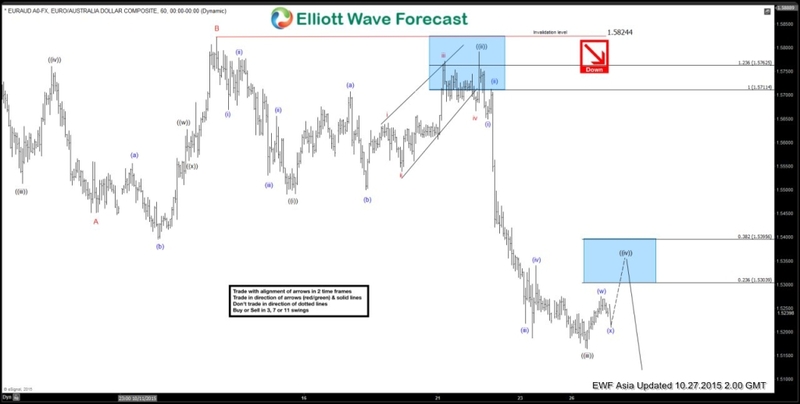 Best reading of Elliott wave cycle suggests decline to 1.545 ended wave “A” and bounce to 1.582 ended wave “B”. Wave “C” is in progress as 5 waves where wave ((i)) ended at 1.549, wave ((ii)) ended at 1.579, wave ((iii)) ended at 1.516, and wave ((iv)) is in progress towards 1.53 – 1.539 area before turning lower in wave ((v)). We don’t like buying the proposed bounce in wave ((iv)). As far as 1.5824 pivot stays intact, pair is expected to go lower one more leg to complete wave ((v)) of C.